My kids drink mostly water. They were never big juice drinkers, which is good because I would have limited the amount they drink. Unfortunately they're not big milk drinkers either (though I'm pushing my daughter to drink more so she can stock up on calcium in her bones before the rate starts declining). 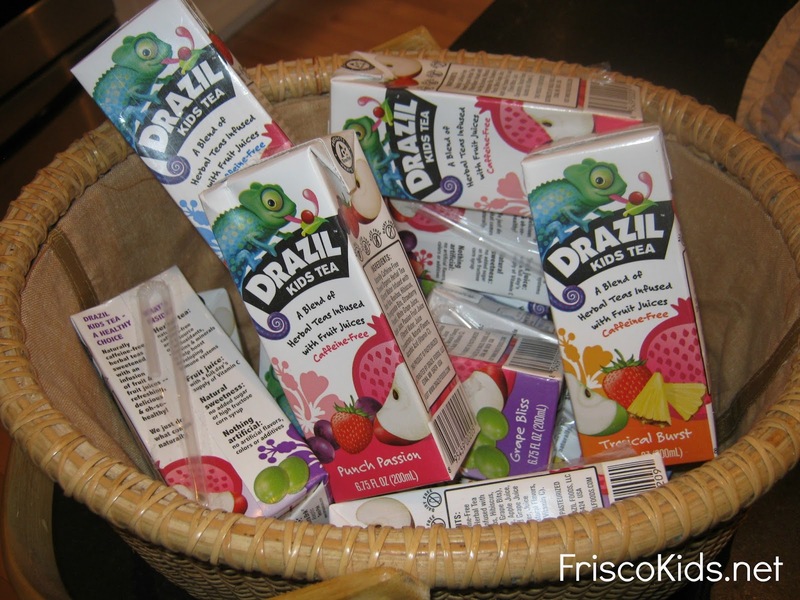 But I digress, Drazil Kids Tea contacted me to do a paid review of their kids tea/juice combination, and I agreed, because I thought it sounded like a product that my kids would like. And it's something different and more healthy to drink. 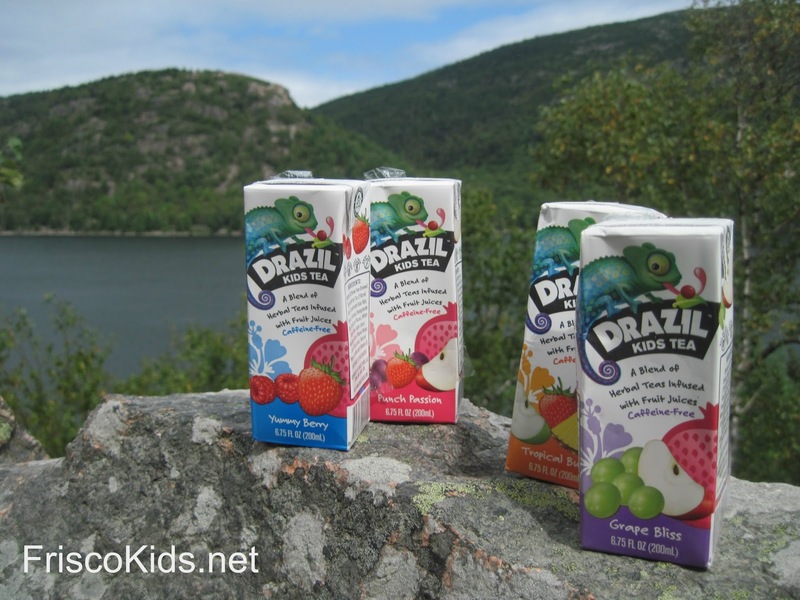 Drazil is a tea/juice combination, containing 45% juice (and 100% Vitamin C for the day), it's (almost) organic and 50 calories a serving. Instead of water as the other half, it contains caffeine free herbal tea. It comes in a single serving juice box. It's pasteurized, has tons of antioxidants, blah blah blah. which helps explain the logo. 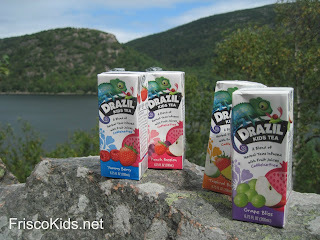 Though on our recent vacation, where we brought the kids tea boxes, we continuously argued over whether it was pronounced Drazil with a long "a" like "brazen" or with a short "a" like Brazil. Since we had a long drive to our destination, we packed it with the snacks. We try to limit soda drinking, and soda needs to stay really cold to be good, so this was a great option for something sort of sweet to bring. 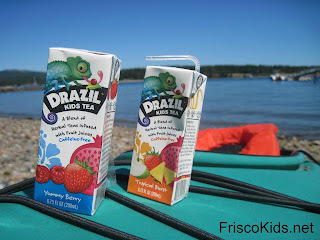 We also brought it with us on hikes, a bike trip and kayaking, as a treat alternative to water. My daughter really liked it, which is good because she's not a tea drinker. She had her flavor preferences (the berry and the grape) and I liked that the calorie count was low. It reminded her of the juice I used to give her when she was younger, which was watered down. I don't say that in a bad way. She liked that juice and wasn't used to the fully sugared up stuff. I'll be sending the boxes with her to school when she wants an alternative to the water she usually packs. Drazil Kids Tea is currently available only in the SF Bay Area (well, an expanded version of the Bay Area), and online at Amazon (they participate in the free shipping for $25+ and for Amazon Prime members). At the store, they are $5-6 for an 8-pack. Disclosure: Drazil Kids Tea sent me samples for the family to try, and compensated me for this review. All opinions are my own.